Valentine’s day is just around the corner. Everyone is busy thinking about what new and different gift can be given this Valentine to their loved ones. Markets are flooded with innumerable options, so much so that one might go crazy in deciding which one to take. But here is the twist. A gift made personally with love and care is the most priceless of all. So what are you waiting for? Get your act together, put on your creative hats, team up with your little one, and make some beautiful gifts that can become part of a cherished memory for your loved ones. 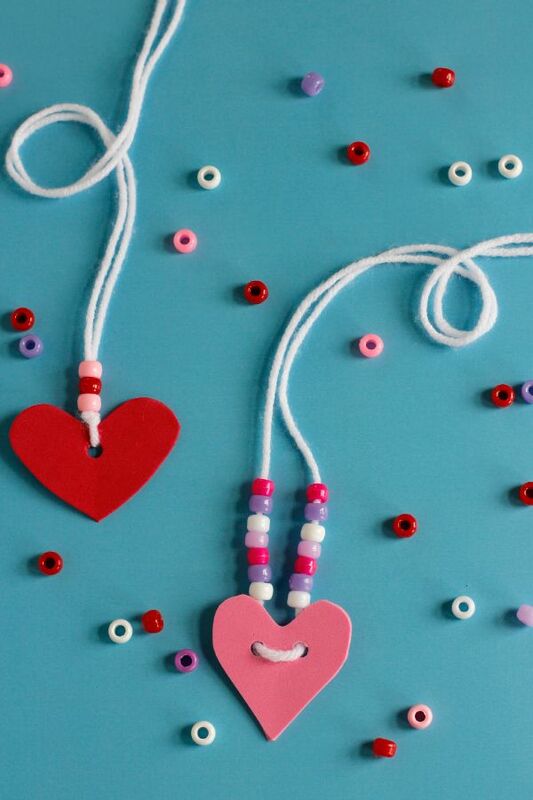 For your aid, TCT brings you 5 fun and easy Valentine’s Day crafts that you can do with your kid. So what if the Sun God decides to play hide and seek with Cupid, the God of love this Valentine. Add warmth to your home and hearth with this super interesting heart-shaped Suncatchers. Fold the gift box at the corners after opening it. Cut it out in a heart shape. Cut another heart from the inside of that heart. Keep cutting hearts from inside the previous one, till you no longer can cut anymore hearts. Now match these hearts to the other side of the gift box so that they are similar. Place half of the heart cut-outs with the good side up on the contact paper. Cut the tissue paper in square shapes. Now place the tissue paper on the contact paper so that it is slightly overlapping. Now place the second sheet of contact paper on top of this. Attach the strings in the middle with some Fevicol. Seal the contact paper. Cut to remove the extra paper around the hearts. Your exclusive Suncatcher is ready. This is one cute little gift that can be created by little ones to gift it to parents or grandparents. You just need to assist them in this creative journey. Draw the outline of your little one’s hand on the brown cardboard paper. Draw two stripes on either side of the hand and make two opposite cuts. 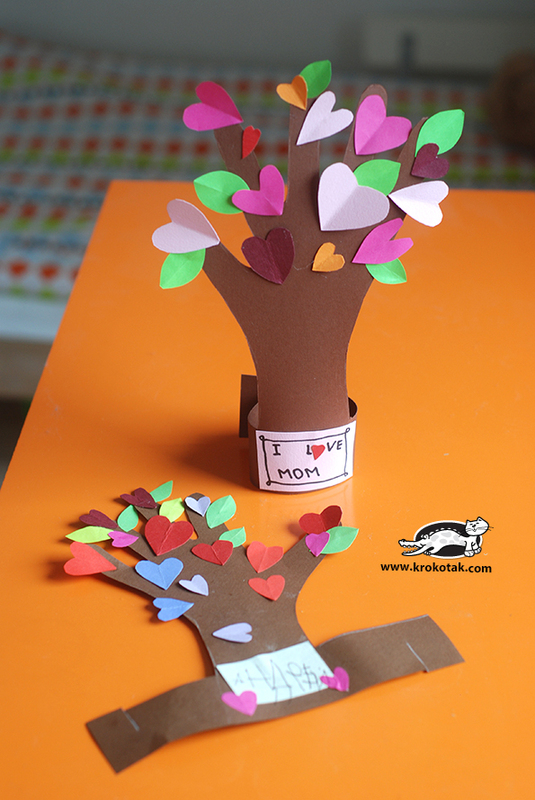 Now cut out small hearts and leaves from the different colored chart paper. Paste onto the cardboard hand. Make the tree handstand by putting the two cuts into another. A message can be written in the front. You can make your little one your accomplice as you prepare a surprise treat for your better half. Try this Cupid’s strawberry float and make it a family affair. Procedure: Grind the strawberry. Now take one tall glass. Place two scoops of vanilla ice cream. Mix the strawberry paste in the soda and slowly add it to the vanilla ice cream. Add whipped cream and cherry on the top. Serve it with a long spoon and a straw. If you have an animal lover in your list of people who you want to send a Valentine gift. Then this is just perfect. Cut out two big hearts from red and pink sugar paper. Make the dog’s floppy ears by cutting the pink heart into two. Now cut out a small black heart for nose and two small white hearts for the eyes. Stick everything together. Cut out a small pink oval shape for the tongue. Mark out two dots on the eyes. The little one can dab their finger in red and create some doggy spots. Write a sweet message and your Puppy Valentine card is ready. While you are going to be celebrating love for the ones you love this Valentine’s Day, extend the emotion to nature as well by letting your little one string cheerios and realize how important it is to love nature and all its creatures. Shape the wire in whatever shape you like. Now string the cheerios on it. Let the little one enjoy stringing it while popping inside their mouth one each time. Once the stringing is over, seal both the ends. Hang it with a ribbon for the birds to enjoy, and your little ones will enjoy watching the birds feed. You can also use something else instead of cheerios to make the feeder.